A scared kid in a new country and a lightning rod for bullies: that was Ram’s reality. He went from bottom of the pecking order on the playground to top of his profession, leading gold medalists and setting new highs at the Olympics. From having his dreams belittled to helping top athletes and business people achieve theirs. Ram is the Head Coach for the Canadian National Badminton Team as well as the Head Coach for the Vancouver Lawn Tennis and Badminton Club. Along the way he has managed to travel to over 90 countries around the globe, perform as a tabla percussionist in live concerts with world class musicians, been hired by several countries to deliver comprehensive coaching programs, and officiate a wedding. As of recently, he has fulfilled a lifelong dream of becoming a published author. 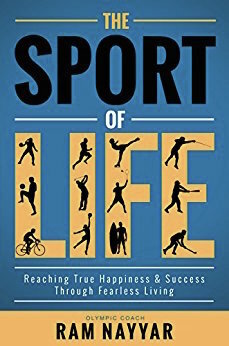 Having written 'The Sport of Life' - a book tailored to help people change their perceptions of what it really means to live life fearlessly and find true happiness and success. Ram's specialty is to empower others by 'Teaching Fearlessness". The cornerstone of our company is to empower those we work with and help them accomplish their goals. Ram has also obtained certifications as a Chartered Professional Coach, Master Learning Facilitator and a Diploma in High Performance Coaching. For a list of Ram's achievements click here. Richard Way is the CEO of the Sport for Life Society and an architect of the Long-Term Athlete Development (LTAD) Framework. Richard has facilitated the use of Long-term Athlete Development Model for over 30 sports in more than 50 countries, and co-authored the book published by Human Kinetics called: Long-Term Athlete Development, with Istvan Balyi and Colin Higgs. Richard serves on the faculty of the Institute for Global Studies at the University of Delaware and is the President of the International Sport for Life Society. A thought leader on physical literacy, Richard is a founding member of the International Physical Literacy Association. Additionally, he was the Director of Sport for Vancouver’s successful 2010 Winter Olympic Games Bid Corporation, a former commission member of the International Luge Federation, and former executive of the Canadian Luge Association. Richard represented Canada in nine Luge World Championships and was an All-Canadian West soccer star for the University of Calgary. As well he is proud father of three aspiring athletes aged 18, 16 and 14. Mark cannot dunk a basketball or count cards in Vegas, but he was born with an uncanny talent for visual thinking. Simply going through the process of "Business Visualization" helps people and organizations see with clarity. Mark has owned and grown several wildly successful national franchises and credits his achievements to his innovative method of business visualization. Krista is a senior level action-oriented marketing & events freelancer who has more than 20 years’ experience working with 25+ different companies and organizations bringing new ideas, a creative approach and a professional and detail-oriented style. In 2000, following seven years in marketing & events roles in both amateur and professional sport, Krista launched a consulting business, iSPARK Consulting, and assembled a team of like-minded professionals to offer marketing, communications, event planning/management, sponsorship, and fundraising, consulting and contract services. iSPARK’s clients include community-based sporting events, national and multi-sport organizations, not-for-profit associations and corporations. Krista does work with the Canadian Sport Tourism Alliance, the Canadian Paralympic Committee, Commonwealth Games Canada, Physical & Health Education Canada, the Canadian Association for the Advancement of Sport and Physical Activity, and more. Krista has also served on Mission Staff for several multi-sport games, including the 2000 and 2002 Paralympic Games in Sydney and Salt Lake City and the 2008 Commonwealth Youth Games in Pune, India. She is also an accomplished researcher and published author and regularly teaches and presents to students at the university and college level.